There are many excellent guide services available on the Kenai Peninsula for other types of exciting fishing. 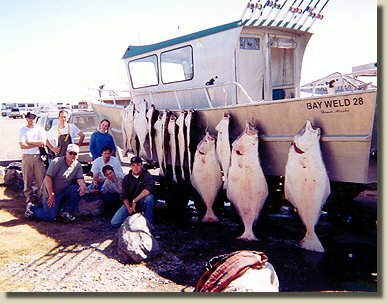 Many of our guests arrange halibut trips out of Homer or saltwater combo trips (salmon & halibut) out of Ninilchik or Anchor Point. Also available are remote Fly-In fishing trips across Cook Inlet for salmon, trout or grayling. Based on our own experience and that of our past clients, we can highly recommend the charters listed below. If you do book with any of these charters, please tell them that you were referred by Alaska Kenai King Charters. Thanks!